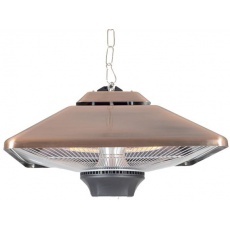 The La Hacienda Adjustable Copper Coloured Hanging Patio Heater. Efficient, powerful and sleek, this extra-large hanging infrared electric heater is perfect for attaching to large outdoor pergolas and will keep everyone warm from above during cooler days or nights. 2 soft touch heat settings. Average element life 5000 hours.